In a paper published in PLOS ONE, researchers at the Montclair State University found in their study that clenching fists can help form and recollect memory. 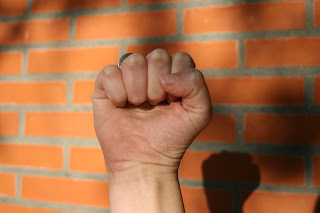 In their paper, they observed that clenching the right fist can help in forming stronger memory and clenching the left fist can aid in recollecting them. Finding ways to improving memory has been a popular practice specially with older people. As one ages, the ability to form and retain memory reduces. In a related article, The Memory Toolbox, memory loss is attributed to stress. Stress affects the way the brain processes information in a way that memory can be impaired or not even be retained. Within the brain, the frontal lobe is attributed in retaining long term memories. These are memories that are not task based (like driving a car) but are those associated with emotions. The Montclair study suggests that some body movements affect the way the brain processes certain tasks such as improving memory. There are a lot of techniques that are used to improve memory (75 are listed in The Memory Toolbox). Imaging technologies such as MRI (Magnetic Resonance Imaging) and fMRI (functional MRI) have also contributed to studying and observing brain activity in relation to how it processes information. Clenching your right hand may help form a stronger memory of an event or action, and clenching your left may help you recollect the memory later, according to research published April 24 in the open access journal PLOS ONE by Ruth Propper and colleagues from Montclair State University. Participants in the research study were split into groups and asked to first memorize, and later recall words from a list of 72 words. There were 4 groups who clenched their hands; One group clenched their right fist for about 90 seconds immediately prior to memorizing the list and then did the same immediately prior to recollecting the words. Another group clenched their left hand prior to both memorizing and recollecting. Two other groups clenched one hand prior to memorizing (either the left or right hand) and the opposite hand prior to recollecting. A control group did not clench their fists at any point. The group that clenched their right fist when memorizing the list and then clenched the left when recollecting the words performed better than all the other hand clenching groups. This group also did better than the group that did not clench their fists at all, though this difference was not statistically 'significant'. "The findings suggest that some simple body movements - by temporarily changing the way the brain functions- can improve memory. Future research will examine whether hand clenching can also improve other forms of cognition, for example verbal or spatial abilities," says Ruth Propper, lead scientist on the study. The authors clarify that further work is needed to test whether their results with word lists also extend to memories of visual stimuli like remembering a face, or spatial tasks, such as remembering where keys were placed. Based on previous work, the authors suggest that this effect of hand-clenching on memory may be because clenching a fist activates specific brain regions that are also associated with memory formation.